Claire Lyons is the new girl at Octavian Country Day School, an exclusive private school in Westchester County, New York. But Claire is totally unprepared for the social (and fashion) demands of her new classmates. To make matters worse, Claire's family is living in the guesthouse of one Massie Block, the queen supreme of her new school And Massie couldn't be less thrilled with the new squatter on her family's estate. Does Claire have what it takes to go toe-to-toe with the "it" girl in her school? Lisi Harrison's debut novel introduces us to THE CLIQUE - a quartet of popular girls attending private school in New York. These girls are wise (and rich) beyond their twelve years, valuing their designer clothes, sparkling homes, and precious cell phones above all else. At the top of the clique is Massie, a girl whose room is modeled after an all-white posh hotel suite. When her father's longtime friend has a stroke of bad luck, Massie's dad lets his friend, his friend's wife and his daughter stay in the guesthouse. This girl may be Massie's peer and new classmate, but, since she is clad in overalls and Keds, Massie is reluctant to make friends. What follows is a somewhat predictable but squeaky clean story, appropriate for middle grades to read. Think a G-rated version of Gossip Girl: money talks, clothes matter, but friendship and backstabbing are the main issues instead of dating and, ahem, other more adult things. In other words, if you like the movie Mean Girls, you'll like this book. This is the most realistic book about girls in middle school I have ever read. it gets how girls go after each other,popularity,boys,puberty,and the lower,middle,and high class people. Lisi Harrison gets how girls go after each other, and of course, the clothing brands and how it interprets with a girls popularity! I read this way back when, in middle school probably, at the pressure of my friends. I finally gave in and borrowed the book from one of them. I don't know if it was the mean, horrible girls or that I wanted to be in Dylan's position, but I read through this story every second I could get at lightning speed. I like this book, and the other books in this series are just as great. I think I stopped reading after book 5, but I'm sure they are just as good! This is a great story and I give it 4 out of 5 stars. It is a book for girls in 5th-8th grade who love books that contain drama, back stabbing, or anything else that happens in the world of teenage girls. It was a story that I highly enjoyed because it seemed so real and I was able to imagine every event as if it was happening right before my eyes. This is a great story and I give it 4 out of 5 stars. It is a book for girls in 5th-8th grade who love books that contain drama, back stabbing, or anything else that happens in the world of teenage girls. It was a story that I highly enjoyed because it seemed so real and I was able to imagine every event as if it was happening right before my eyes. Taht is why I loved the clique. This is a great story and I give it 4 out of 5 stars. It is a book for girls in 5th-8th grade who love books that contain drama, back stabbing, or anything else that happens in the world of teenage girls. It was a story that I highly enjoyed because it seemed so real and I was able to imagine every event as if it was happening right before my eyes. That is why I loved the clique. she isn't about to go down without a fight. Mean girl cattiness ensues. moral or psychological message about the motivations of the characters. a lengthy series, the first book can easily be read as a stand-alone. Reprinted with author's (my) permission. i think this book was really nice because it gave me the experience of what a REAL girly clique is like. i thnk it was funny because of how girly the book was and i am totally not a girly girl. i think that even though some schools are filled with those snobby, rich cliques but it's kinda funny because of how they are. if i had a clique like that at school, i would think they were interesting because i dont know any real cliques like that. Can I just slap every single character in the face? Including the editor? OK first I would like to address some grammatical errors, such as forgetting periods at the end of a sentence and using the wrong verb tenses in one or two cases. Second, I just want to slap Massie's little face off. She is such a snobby, stuck-up b*tch! And all the other girls (who would have been alright) just follow Massie around like little DOGS just doing whatever she says.....if Massie says it's cool, it's cool, and if Massie says it's not cool, it's soooooooo out. Like Claire, who's out faster than you can say "Not a G.L.U." Claire was the best character, but I think she should have gotten back at Massie via public humiliation. Not JUST the sly, sneaky stuff, but maybe pour red paint on HER white jeans. And being nice to Massie in the end? Bull c r a p.
The Clique is about a group of (stuck-up) girls who go to Octavian Country Day School, a private girls' school. But then Claire comes along, and she's staying in Massie's (the group leader) family's guesthouse. Claire is nothing like the Clique girls, but desperately wants to be accepted by them. I though that Massie and her friends were really cruel at times, and that Claire let herself be pushed around by them too much. All in all, it was a cute book and fun to read. 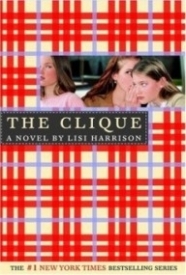 The Cliqueis the fist book of the clique series by lisi harrison the book centers around the twomain characters: Massie and Claire. Claire just moved from florida to Massies guest house.Massie instantly dislikes Claire. Claire despratly trying to fit in in one of OCD's popular cliques. this book was awesome the only thing was that the book kinda starts off slow and borging.the girls in the book you eithier love them or hate them this book is great.